Flex and rigid-flex PCB constructions have many variations that allow for a wide range of applications and solutions. A significant difference to rigid PCB constructions is that uneven layer counts are allowed and frequently used. The primary reasons being reduced flex thickness, improved flexibility and reduced part cost. The following are examples of some of the more commonly used constructions found in applications throughout the industry. Flex circuit layer count can vary from 1-6. Designs with greater than 3-layers will have limited bend capabilities due to their thickness. All constructions can utilize both plated through holes (PTH) and surface mount technology (SMT) components for either interconnect or active designs. Stiffeners are commonly either Polyimide or FR4, depending upon the application. Stainless steel and aluminum stiffeners can also be used for special applications. Common Application(s): ZIF to ZIF interconnect. Allows access to one layer of copper from both sides of the design. Common Applications(s): Connector to connector flex, functional circuit. Flex core can be either Adhesiveless or Adhesive based depending upon finished thickness required to meet bend requirements. Common application(s): Stripline controlled impedance, radio frequency (RF)/electromagnetic interference (EMI) shielded. Can utilize either FR4 or polyimide stiffeners. Flex cores are typically adhesiveless to minimize flex thickness and allow for bend requirements. Higher layer counts available. Review of bend requirements recommended. The combination of rigid PCB technology and flex circuit technology allows for a very wide variety of rigid and flex layer counts and combinations. Rigid areas can utilize blind and buried vias, with some limitations, and via in pad technology. 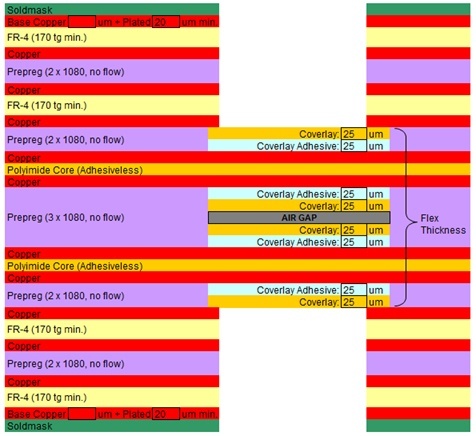 Rigid area layer counts can range from 2–20+ and flex area layer counts from 1–6+. Designs can have multiple rigid sections and can incorporate flex tails with ZIF contacts or connectors. While not limited to it is preferred that the flex layers be centrally located within the rigid area so as to minimize any potential warp and twist. Many configurations allow for controlled impedance and or shielding in the flex areas. The examples below contain only 1 or 2 rigid areas for simplicity. Common application(s): Simple designs with limited requirements. 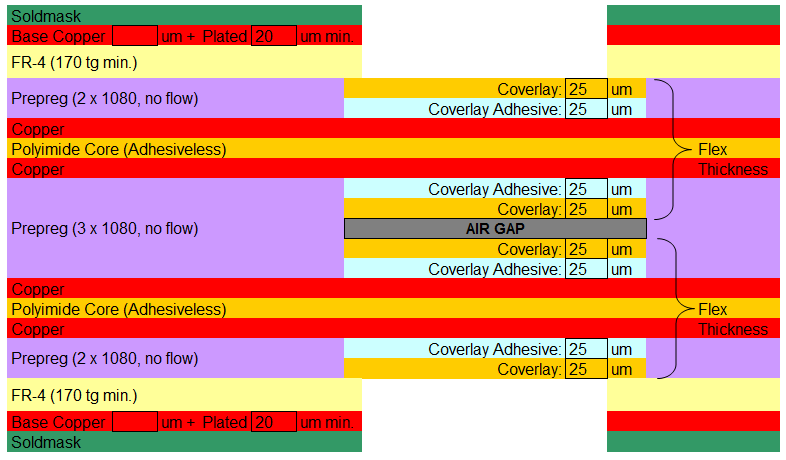 Flex layers configured as two pairs of 2 layers with air gap between pairs for improved reliability and flexibility. Allows for controlled impedance in flex areas. Considering all the possible combinations, we have only displayed a small sample of the available flex and rigid-flex PCB constructions. When designing your flex circuit, it is important to use the IPC specifications for specific flexible materials, circuit design, performance, and assembly of flexible circuits. 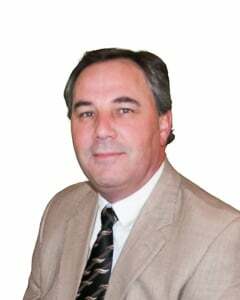 Please contact us if you have any questions or need assistance determining which construction best meets your flex and rigid-flex design requirements. During Epec's quoting process, we carefully examine specifications, materials and construction in order to minimize expenses and eliminate any technical issues, delivering the best possible product to our customers!